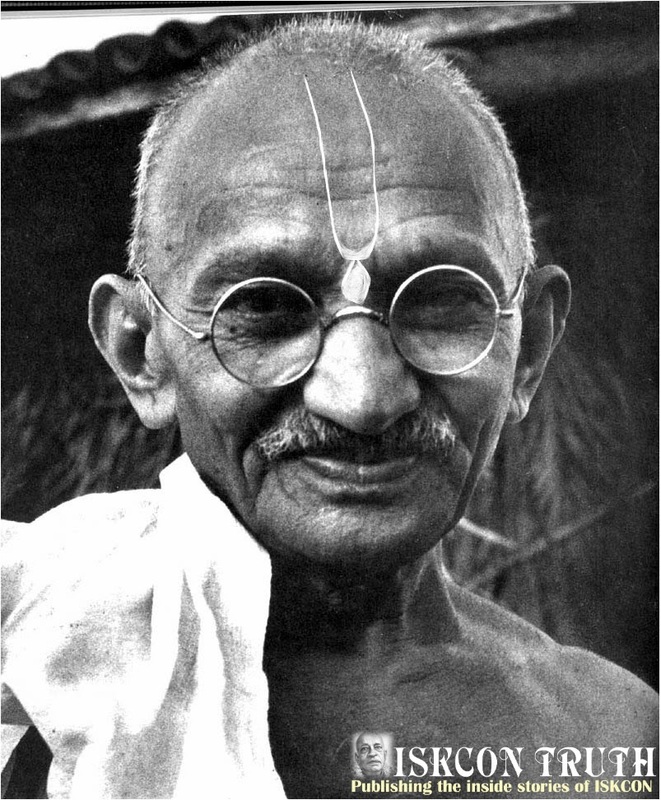 After the death of Gandhi, Srila Prabhupada approached the Government requesting for funds to set up a spiritual society based on Gandhian principles. He sent a letter to Sardar Vallabhbhai Patel, who was the Deputy Prime Minister of India at that time. Patel, known as the Iron Man of India, was intensely loyal to Gandhi. Srila Prabhupada requested him to adopt a Gandhian way to utilize the fund collected to commemorate Gandhi. He also wrote to Gandhi Memorial Fund on this subject. In his letters, Srila Prabhupada proposed to promote four major principles of Gandhi, with certain adjustments on the basis of the scriptures. Gandhi never missed to attend the ram-dhun kirtana. He attended his daily prayer meetings in the evening without fail, till the last moment of his death. Srila Prabhupada proposes to make this sankirtana movement more popular all over the world by philosophical discourses based on reasoning and moral and ethical codes. This is the easy way to subdue the evil propensities of people in general and raise their moral standards. To achieve this, he recommended conducting regular prayer meetings with sankirtana in Gandhi memorial buildings and daily reading of one chapter from Bhagavad-gita, the favorite scripture of Mahatma Gandhi. Gandhi started another spiritual movement called Temple Entry Movement and he wanted to give this facility to everyone irrespective of caste distinction. He himself installed the deity of Sri Radha Krishna at Noakhali. He believed that not a blade of grass moves without the sanction of the Lord. The temples are centers of spiritual culture and there are thousands and lakhs of temples in India, not all of them were properly managed. Most of the temples were neglected and some of them were becoming positive dens of undesirable activities. Srila Prabhupada proposes to reorganize the temples in the country as centre of spiritual culture and diffuse spiritual education according to authentic principles as laid down in the scriptures like Bhagavad-gita. People can thus be educated and trained up to focus the disturbed mind and concentrate on higher duties meant for realizing the existence of God without whose sanction “not a blade of grass moves”. Gandhi worked for the welfare of lowborn people (the chamaras and the bhangis – the sweepers and toilet-room cleaners). Gandhi called them harijanas (the children of God). But it should be understood that simply by being rubber-stamped one cannot elevate oneself to the position of harijana. Birth is not a disqualification. There is no harm to pick up a low class man and elevate him to the position of harijana. Everyone can become a harijana, but not by rubber stamp. Training should be there. What is that training? That is explained in Bhagavad-gita. By adopting the principles of karma-yoga, i.e. doing everything for God's sake. The activities of the general public may not be stopped but may be diverted in the manner stated in the Bhagavad-gita. By doing so any one in the world can be turned into a harijana. Srila Prabhupada proposed to implement the system of spiritual initiation by which people can be elevated to the status of harijana. Let Gandhi’s harijana movement not be taken absolutely for the benefit of the bhangis but be utilized for even those who have the mentality of the bhangis. Thus the harijana movement shall be strengthened more scientifically based on the principles of Bhagavad-gita. Mahatma Gandhi wanted a classless society to end the caste system. The scientific division of the caste system as envisaged in the Bhagavad-gita is natural. It is meant for classifying the human society according to their quality and work; not based on their birth rights. It is not possible to eradicate this caste system made by God. But the vitiated caste system in India at the time of Gandhi, was not the authentic one sanctioned by the scriptures. The basic principle of caste system is to serve the plan of Godhead and thereby ensure spiritual and material progress for everyone in the society. Srila Prabhupada proposed such a scientific and natural division of human society according to their quality and work with the aim of giving everyone a chance to become elevated to the status of harijana.